Handbags and Purses to crochet and knit: Theses bags that are roomy but not bulky; Easy to open and close, comfortable to carry; Above all, smart and new, one to match every costume and every mood. 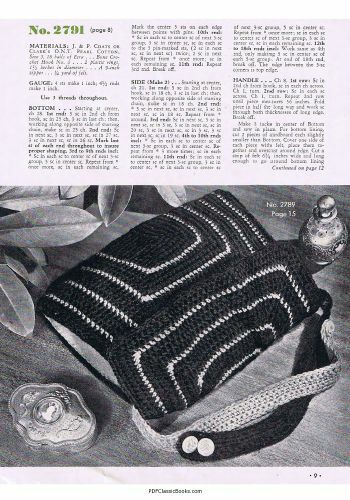 Originally published in 1945 by The Spool Cotton Company, this booklet contains 16 handbag & purse patterns for you to crochet and knit. All patterns come with complete instructions. 16 Purses and Bags to Crochet and Knit Patterns crafts;crochet;knit 149354890 3.75 craftdrawer Fresh Download Available!